Latest News (16.05.2018) -The good news is that MHA has declared the IB ACIO Executive Mains Result 2018 on official website. The shortlisted candidates are called for interview. The interview has been scheduled on 25th May 2018. IB ACIO Interview call letter has been uploaded now. The interview letter has also been sent to the registered email ID of the candidates. You can also download it from the email account. The interview centres/ venue has been mentioned with the interview schedule. 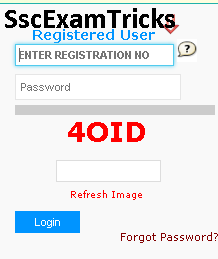 The mains result is uploaded in PDF File and you don't required registration number and password. But the same are required to download IB ACIO Executive Interview Call Letter 2018. The image provide you a glimpse of mains result. Those candidates who have been shortlisted for interview or qualified IB ACIO Executive Mains 2018; they can download their interview letter from the link given in the end of this article. 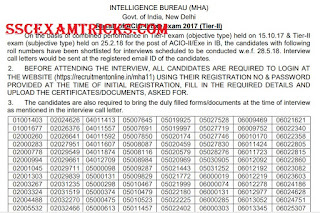 The mains admit card has been sent to the email ID of the candidates. The candidates are advised to visit the registered email ID and download the same. Only a single page is given which may be printed on colored page. The good news is for those candidates who have planned to apply for IB ACIO Executive Recruitment 2017, but did not applied till now. The last date has been extended to 10th September 2017. The last date for submitting application fee will be 12th September 2017. The good news is that IB has uploaded the online admit card for ACIO Grade II / Executive on official website. The candidates are required to login their account before downloading call letters. The date, time and venue of examination has been mentioned in this call letter. 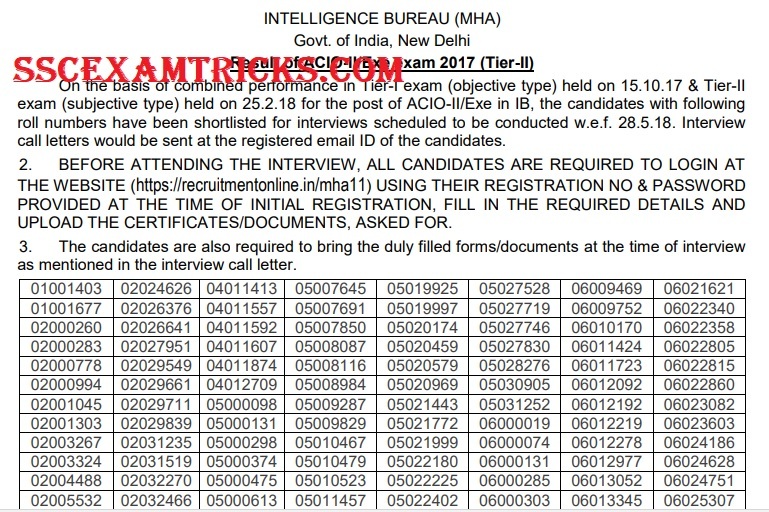 Those candidates who had applied for these posts and waiting for their Intelligence Bureau Assistant Central Intelligence Officer Grade II/ Executive Call letter 2017; they can download it from direct link given at the end of the page. 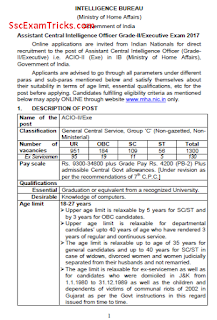 Ministry of Home Affairs (MHA) will release online Admit card about 15-18 days before Pre exam to be held on 15th October 2017 and Mains Exam 07th January 2018 at various centers for the posts of Assistant Central Intelligence Officer Grade II/ Executive. Interested candidates can apply online now. The direct link for applying online application form is given at the bottom. The online admit card will be available about 15-18 days before these examination dates. 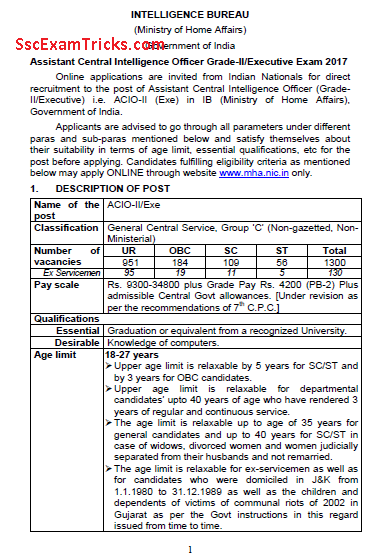 Ministry of Home Affairs (MHA) had released notification and invited applications from 12th August to 02nd September 2017 for posts of Assistant Central Intelligence Officer Grade-II/ Executive. Many candidates are ready to apply for this recruitment and many others have submitted their online application forms on the official website. The selection process will be made through written exam (preliminary & mains exam) and interview.